Of the 61 listed Monuments of Bidar, 30 are tombs. Little wonder then that Bidar is known as The City of Whispering Tombs! 135 Kms from Hyderabad, just across the state border in Karnataka is Bidar. If you love visiting places of historic significance and can’t get enough of architecture, this is one road trip that you must make from the city. The most prominent landmark of this city – which dates back to the third century BC – is the Bidar Fort. It was built by the first sultan of the Bahamani Dynasty, Ala Ud Din Bahaman Shah when he set up his capital and 4Kms from here is the final resting place of the Bahamani Sultans. 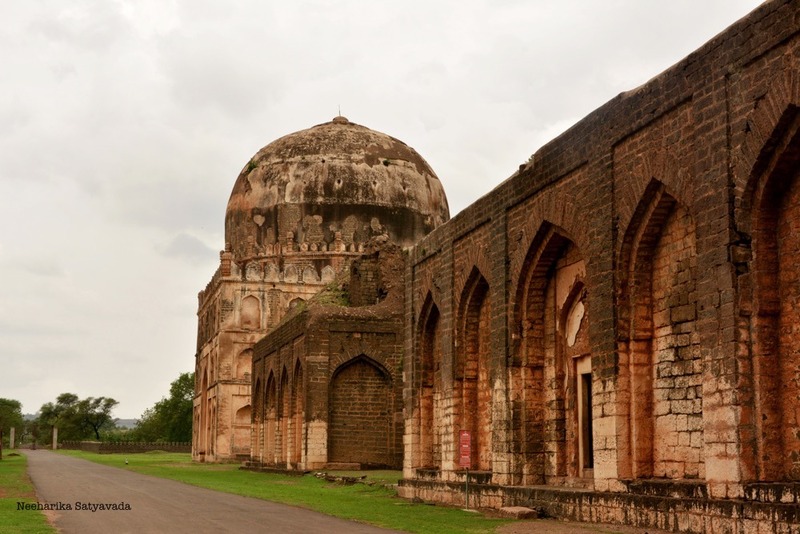 No visit to Bidar is complete without a trip to these majestic structures located in Ashtur, The Bahamani Tombs. Some of them are in a state of disrepair today, but even these crumbling mausoleums stand a beautiful testament to the art of an era gone by. En route to Ashtur just before you get to the Tombs, on to the left is yet another idyllic setting to rest for eternity, the expansive and peaceful resting place of Hazrat Khalil Ullah, a popular religious preceptor of the time. Known as the Chaukhandi, this octagonal structure is beautiful in its simplicity and clean lines. Great pic and a great post! Not many know how enchanting a place Bidar is…but your pictures showcase the city in an amazing manner!